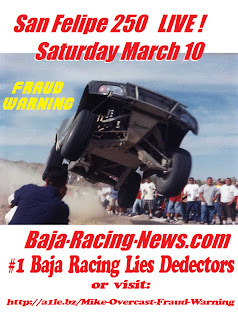 San Felipe 250 warning. Baja California Tecate SCORE San Felipe 250 pirated merchandise warning. As announced by the fraudulent culprit himself on his lie-and-platigar-content show there might be a possibility of pirated items to be offered. This is not just limited to the DVD's he announced himself but also other racing related merchandise including NASCAR t-shirt, caps and so on. Be aware!